If modern simplicity is your thing when it comes to interior styling then the stunning, smooth curves found on the Murcia Chrome Kitchen Tap will certainly benefit contemporary settings. 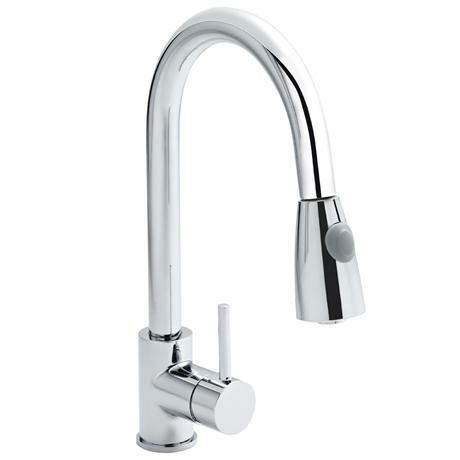 The Murcia Kitchen Tap has a single lever handle which is fitted with ceramic disk technology. This allows users to easily control the temperature and pressure of the water and also avoids the risk of dripping which can often occur when rubber washers are used instead. One of the neat features the Murcia Tap has is the pull out rinser spray function. This spray is flexible so it means that food preparation can be made quicker and easier than ever. Manufactured using high quality brass internals, this kitchen tap is finished in gorgeous polished chrome that will look superb next to your kitchen sink. The hose is made from hi-grade plastic to ensure it lasts for a long time and copes with regular use. This item comes supplied with fittings and requires at least 1 Bar of water pressure to function correctly. 5 year guarantee. Wanted movable spout kitchen tap that didn't have the spiral coil on the outside. This fits the bill perfectly - stylish.